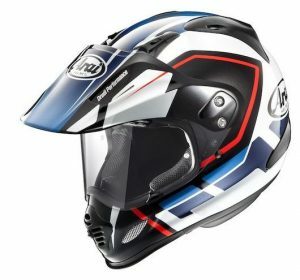 10 Best places to buy an Arai crash helmet? 15 Alternatives to the Arai Tour-X 4? 16 Definitely want an Arai? Arai Tour X4 Dual Sport Motorcycle Helmet review – Arai’s most verstaile helmet ever? 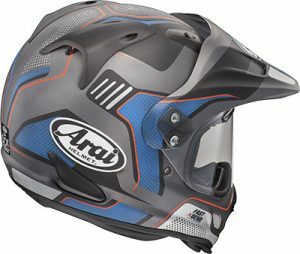 Arai has designed the Arai Tour X4 to be probably the most versatile helmet in their range. Out of the box, it looks like a regular adventure helmet, with sun/roost peak and large visor giving it the look of a helmet that should work nicely off road. But, like many adventure helmets, you can remove the peak entirely to make what looks like a more-or-less regular full face helmet. Or you can remove the visor, bung on some goggles and hey-presto, you’re in a motocross helmet. Which makes the Arai Tour-X 4 one of the most versatile helmets on the market. And as usual with Arai helmets, their design goal – alongside making a helmet that’s as safe as possible – has been to produce a nice round helmet with any vents or spoilers being as low and close to the helmet as possible to increase ‘roll-off’ during an accident and reduce noise created when air flows over the helmet. Worthy aims indeed. But have they pulled it off? 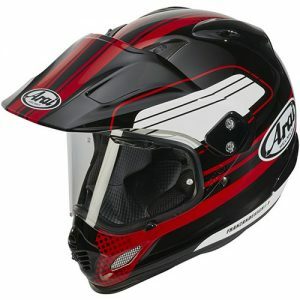 The Arai Tour-X 4 is, like most new Arai models, very much an evolution of what’s gone before. Check it out alongside the Tour-X 3 and you’ll be hard-pressed to spot much difference. 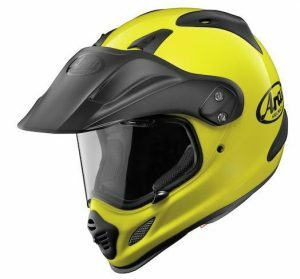 But that can very much be a good thing as it means Arai have taken their well-regarded adventure helmet and improved its performance where they (and their customers) think it needs it. As we mentioned, the Tour-X 4 is a properly versatile adventure helmet. 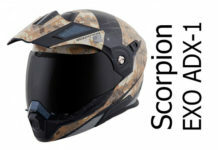 As you can see below, that means you can wear it in regular dual-sports mode with visor and peak (which is how it comes in the box), or you can pull off the visor and re-fit the roost guard/peak and you’ve now got a full-on motocross helmet which will even fit goggles inside that nice wide visor opening. Of course, if you’re intending doing some serious miles on tarmac, you might want to use it in conventional mode. That means, pulling off the peak, transforming it into a more regular full-face helmet. All you need to do to make the transformation, is unscrew the peak by taking out a couple of nylon screws on either side. If you’re happy with that, you can bung up the holes using the replacement side-pieces that come in the box, so you don’t have unsightly holes in the side of the helmet. Or you can remove the visor and screw the peak back on to make the motocross version. All of which makes the Tour-X 4 one incredibly versatile helmet! Arai goes to massive lengths to make helmets that are as safe as possible. The Arai Tour X4 is ECE 22-05 tested/approved, and the version sold in the States is both DOT certified and has been tested/certified by the Snell Foundation. 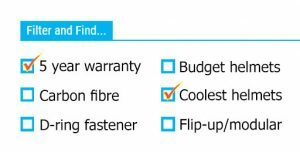 All of which is very good and exactly what you want to hear when you’re buying a helmet. 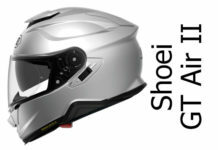 Arai has also designed the Tour-X 4 to share its R75 helmet form which is supposed to improve ‘glancing off’ performance so the helmet skids rather than grips during an impact (though as we’ve previously found on this site, there doesn’t appear to be much actual science to back this up) and they use one-piece multi-density polystyrene linings inside the helmet to give improved shock absorption at different speeds. This last point is something you find in the best performing helmets. Unfortunately, all this careful safety design isn’t always reflected in great SHARP safety ratings. You can read all about SHARP here, but in a nutshell, even though Arai obviously works its little socks off to make amazing, premium helmets, that doesn’t always translate into the safest helmets – at least as far as SHARP safety test results are concerned. Over the years, 12 Arai helmets have been tested and their average score is 3.4/5. 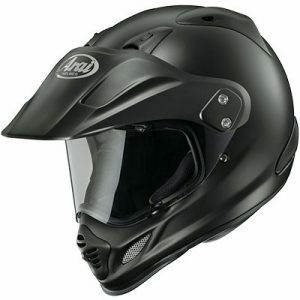 Not poor by any standards, but not the best either – which is kinda what you’d expect from expensive helmets like Arais! The Arai Tour-X 4 hasn’t been tested by SHARP yet so it’s impossible to say how well it’ll perform in an accident (so we’ve given it our default safety score of 3 stars until we know for sure). However, if you want to make sure any helmet is going to give you maximum protection, when you buy your next helmet, first-off, make sure it fits right. According to experts – including the SHARP testing labs – a great fit is the number 1 factor in getting a helmet that’ll give you the best protection. Where there’s a decent SHARP score, you know it’s a helmet that’s going to offer as much protection to your head as possible. But since it hasn’t been tested by them yet, there’s a few other things we can look at. That Shell is made of what Arai call their CLC complex laminate construction – including materials Arai calls ‘superfibres’, which are essentially high-grade fibreglass layers designed to offer more strength and bending resistance. 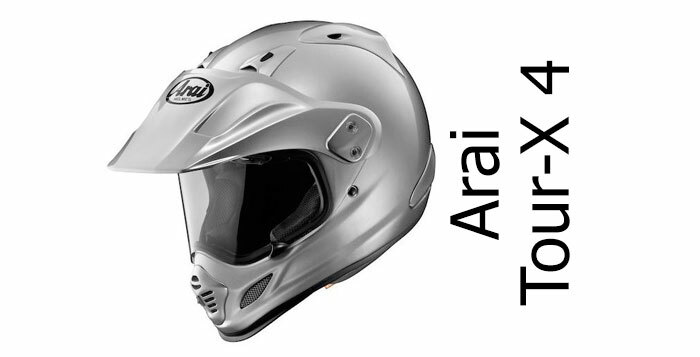 All of which points to a more rigid shell – something that’s not necessarily a great feature in a crash helmet that needs to absorb and dissipate energy rather than simply repel it, and may point to why Arai doesn’t score top marks in SHARP helmet tests (but scores well in Snell tests which have a penetration test)? On the flip side, Arai produces five different helmet shell sizes for the Tour-X 4, which we reckon will contribute to improved safety compared to helmets made with fewer shells. It’ll also make for a helmet that looks better and more in proportion to body size for the wearer. So that’s good. 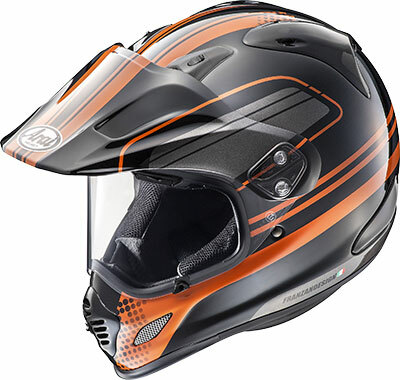 A few final points on safety is that, like all other Arai helmets, the Tour-X 4 uses a traditional double-d ring fastener (absolutely fine though can be a bit fiddly compared to micrometric fasteners) and comes with EQRS built in – for quick helmet removal in an emergency. The new Arai Tour-X 4 has more ventilation holes than the outgoing Tour-X 3. More vents can mean more ways for sound to penetrate the helmet; but it also has a redesigned interior which was designed to keep more noise out. So has it worked? Well, there’s a wide variety of opinions out there. A couple of owners reckoned it’s easily the quietest adventure/dual-sports helmet they’ve ever used and another said it’s on-par with Arai’s road helmets. On the flip-side, a couple of people said it’s really noisy. Also, a few have said they’ve suffered from a whistle or hum that seems to be coming from the peak – possibly from vibrations somewhere on the peak. It’s not an insurmountable problem – one guy cured it by adding lots of duct tape and weights to the bottom of the peak and another used lolly sticks – but it can be really irritating while it’s there. Other than that, the bottom line – as is usual with nearly all helmets – is that how noisy you find the Tour-X 4 depends on lots of factors like how fast you ride, your riding style, what bike you ride, whether you ride a naked or fairing bike – and how quiet your last helmet was (i.e. if it was a real old bucket, then the X-4 will probably feel really quiet). Plus, if you’re taking your Tour-X 4 off-road, you might want a bit of noise coming through to hear the revs and chat with other riders. It all depends. 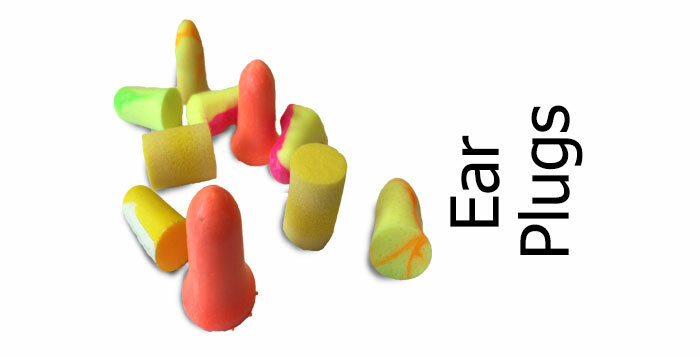 And if you’ll be using your Tour-X 4 mostly on the road mostly, then stick in some decent ear plugs and you’ll find it a nice quite helmet anyway! Ventilation on the Tour-X 4 has been increased from the old X3. You’ll find vents aplenty – 3 in the chin, two brow vents in the visor itself and a couple of large scoops up top. All these aren’t going to be much use unless the air can escape the helmet too – so there’s four large exhaust vents in the shell to the rear, plus there’s a large collar exhaust in the padding at the back. All input vents on the front can be closed off (the bottom chin vents with the gauze over them can be opened/closed/directed from inside the helmet) and the two large top exhausts can be opened/closed too. So far, so many numbers. But do they work? As it turns out, yep they do! Lots of folks say they’re outstanding or very good, offering lots of air to keep visors (relatively) fog free and your head cool. They can be a bit tricky to locate and operate, but then that goes for most helmets (so stick it on and practice before you go out) but they’re decent to use in gloves and some of the vents give a nice positive ‘click’ so you know you’ve just used them. One person said the vents can be a bit fragile, but that’s more a design feature for Arais – all the external bits and pieces are designed to break off easily so they don’t dig in and rotate the helmet during an accident. Usefully, most of these external vent covers are available to buy should you drop your helmet or if they snap off. The visor is large and contoured to the shape of the helmet and has integral venting in the form of brow vents directly in the visor. It also has Arai’s usual visor lock to keep the visor locked and closed (though there’s no cracked-open position on the lock like you find in some Arais). It isn’t a quick-change visor either which is a shame, but it is Pinlock-ready so you can add a Pinlock anti-fog insert to stop steaming on cold/rainy/humid days. And because the visor aperture is so large, if you do take the visor off there’s room in there for a pair of goggles. By the sound of it, not many people actually bother, but one guy who did said they took his Scott OTG goggles, though it was pretty tight. That Peak works as both a sun visor and, if you take the helmet off-road, as a roost-guard to stop dirt and stones thrown up from other bikes from hitting your goggles/visor. 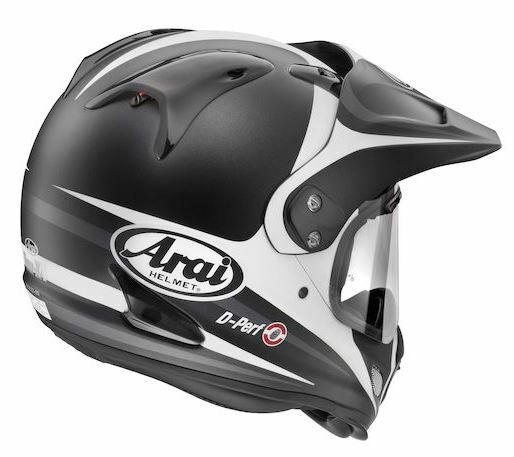 Like most external bits on an Arai helmet, the peak is designed to break off in an accident and so it’s only secured by a couple of nylon screws on either side. And according to one or two owners, that can mean it’s a bit wobbly. If you’re not used to dual-sports helmets, you’d be forgiven for thinking that peak will act as a sail when you’re riding – particularly in a cross-wind or looking back over your shoulder. And truth be told, you will notice it’s there and it can take some getting used to. However, reports are that the peak on the Arai Tour-X 4 is very aerodynamic, with a couple of owners saying it’s OK for up to about 90 MPH before the drag gets really noticeable. It also gives great shade, especially if your visor’s a bit mucky or scratched where one owner said it’s great for stopping sunlight whiting-out the visor by casting shade over it. And apart from the possible whistling noise mentioned in the noise section above, both visor and peak are reported to work very well. Like many Arai helmets, the overall internal shape of the Tour-X 4 is medium oval – which should suit all but the roundest head shapes. That’s helped by an innovative fitting system that Arai uses to help owners tailor the fit. First off, there’s Arai’s FCS or facial contouring system – which is essentially a pair of carefully sculpted cheek pads with additional springing to gently push the cheek pads towards your face to give a nice firm fit. Inside the helmet, the comfort lining has several removable panels – one in each cheek pad and another couple for either side of the head. These 5mm foam panels can be removed to give more room if required. And, like all Arais, you’ve always got the option of buying replacement internals and larger/smaller cheek pad sizes to more fundamentally adjust the fit still further. The foam pads are covered by Dry Cool material which is essentially a nice and comfortable moisture-wicking fabric. And of course everything is removable and washable. You’ll also find Arai’s usual pull-down chin curtain on the inside of the chin guard. There’s mixed reviews on how effective it is – for some it’s useful, for others it gets in the way when you put your helmet on. But all in all, the internals of Arais are usually very plush and very comfortable – and the Tour X-4 is no different. As long as the fit’s right for your head in the first place, most owners find their Tour-x 4s are extremely comfortable helmets. Like most helmets, the plain solid colour designs are the cheapest – so if you’re after a plain gloss white or black (Diamond white/black in Arai-speak) or matt (Frost) black, you’ll find these versions cheaper than the rest. If you’re after a choice of graphics, then there’s heaps of options for the Arai Tour-X 4. There’s the Vision, Move, Mesh, Desert, Detour and Route designs available – all coming in a range of different colours. That’s a lot of helmet designs to choose from – plus there’s new ones coming out all the time (and some being withdrawn) – so to see the latest range of designs and the latest Tour-X 4 deals, please click through to the Arai helmets pages of our recommended shops below. 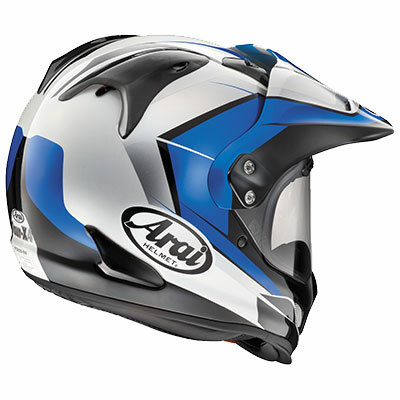 Word is that the Arai Tour-X 4 should be great for most bluetooth communicators. There are large ear pockets inside the helmet and one owner said his Scala Rider Q3 fitted well, as did another owner with a Sena SMH-10. The Tour-X 4 isn’t the lightest helmet in the world, but then it wasn’t designed to be. It weighs around 1.65 Kg (3.6lbs) so is pretty hefty compared to your average full face helmet at 1.47Kg (though about average for a dual sport helmet). But no owners commented on it feeling too heavy – just that it’s very comfortable – so I guess it’s not an issue. Either that or most owners don’t expect an adventure helmet to be featherweight. A couple of owners said that the Tour-X 4 is comfortable if you’re a glasses wearer and it’s easy to slide glasses on while wearing the helmet. As for aero, Arai has carefully designed the Tour X4 to keep the shape as slippery and quiet as possible. And on the ‘slippery’ front at least, they seem to have done well because, while you will notice that peak in the air if you’re not used to a dual-sport helmet, it’s good for stability and lack of buffeting. All round build quality on the Tour-X 4 is universally praised. 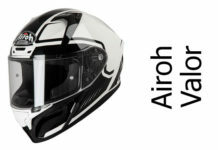 Much of an Arai helmet is hand made and, together with their five-stage QC inspection process, one of the main reasons we buy Arais is because we expect that amazing Arai build quality. With the Tour X 4, a few things can feel a bit wobbly or plasticy, but that’s probably because some parts are designed to break off during an accident. All the rest feels well put together with quality materials. One slight quibble with the X-4 is that the double-d ring fastener, while it works well, it could be longer (and so could the padding on the strap). It’s a very little quibble for most folks and just makes it a bit more fiddly to tie up the helmet. And finally, all Arais come with a 5 year warranty as standard. That’s as long as motorcycle helmet warranties come so far and should last the suggested lifetime of the helmet. The Arai Tour-X 4 has a legion of faithful followers – and it’s not hard to see why. It’s got Arai’s legendary build quality, coupled with tremendous versatility that delivers a full face, motocross and dual-sports helmet all in one package. OK it’s not the lightest helmet around and possibly won’t give the best impact protection (though we’ll have to wait for a SHARP test to find that out) but if you’re after a ‘go anywhere, do anything’ type of helmet that’ll be comfortable for all day riding and with superb ventilation, then the Arai Tour-X 4 has to be toward the top of your list. Owners love it and we think it’s great. 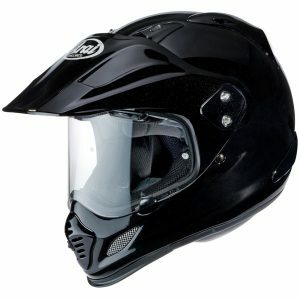 Alternatives to the Arai Tour-X 4? 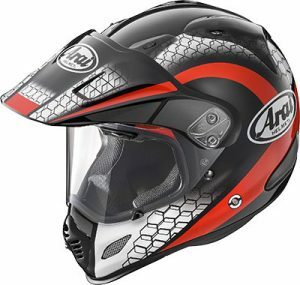 It might be a great adventure bike helmet, but the Arai Tour-X 4 has lots of worthy competitors. 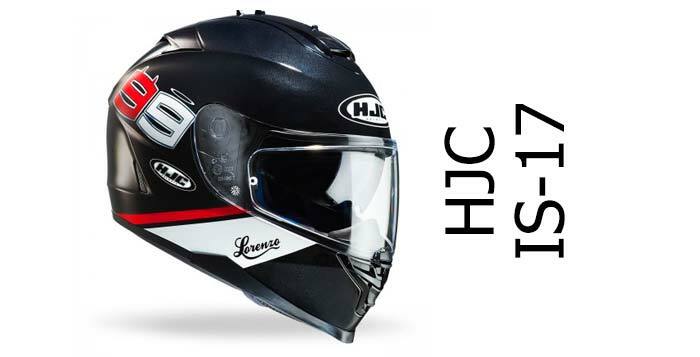 Of the big-hitting brands, there’s the Shoei Hornet ADV; that’s another versatile fibreglass helmet with big visor and EQRS that’s around the same price as the X-4. Or for a smidge less money, you could buy an AGV AX-8 Dual Evo, which is a cool-looking dual sports helmet that’s lighter than the Tour-X 4; though if you’re planning on using goggles you should check it’ll work with yours before you buy (read the review for more info). If you’re on a much tighter budget, the Bell MX-9 dual sport is a cheaper polycarbonate helmet, but still offers great ventilation and lots of comfort, plus it comes with Bell’s 5 year guarantee – so it’s well worth a look. And finally, how about something a bit more unusual? X-Lite’s X-551 is about the same weight as the Arai Tour-X 4 but it’s cheaper and comes with a Pinlock anti-fog and has an integral drop down sun visor. X-Lite are made by the Nolan Group too who are known for great helmet safety (though the 551 hasn’t been SHARP tested). The Arai Tour-X 4 is one versatile helmet. It's an adventure helmet, a motocross helmet and a full face helmet in one. So while it's not a cheap lid, its versatility means it offers real value for money. 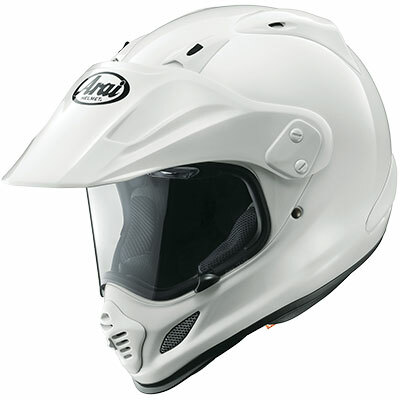 It's also great for comfort and has amazing ventilation along with that legendary Arai build quality. It hasn't been SHARP safety tested yet (dual sports helmets don't tend to be) but if you need an adventure helmet to take you on-road or off, then the Arai Tour-X 4 might well be as good as it gets.